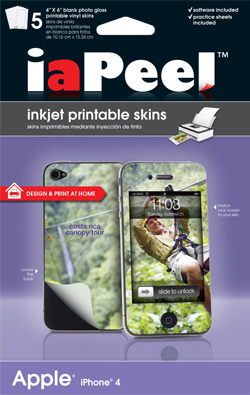 The iaPeel for iPhone: Here, it’s for you! How do you take the world’s coolest phone and make it even cooler? Easy – you add an iaPeel skin! Just like all those great apps you’ve added on your iPhone to make it a one-of-a-kind device, an iaPeel skin gives it a custom touch that’s 100% you. And if you don’t want to get hung up on one look for your iPhone, it’s no problem – you can change skins as often as you like, with no residue left behind. With five skins and easy-to-use software in each kit, you can make skins for yourself and four friends – hey, why not do matching skins for the whole gang! Makes a great gift for someone who’s just made the jump into the incredibly cool world of the iPhone.